As you see, Venus rules both charts via Libra rising. At the May 10th Full Moon (lower left on the dual chart), Venus applies only once: an opposition to Jupiter Rx denoting a period of extravagance, overindulgence, empty posturing, and gaudiness, plus, diplomatic gestures that are likely to fail. Jupiter again is the lead of a Locomotive shape in his many guises as the General, the CEO, the guru or priest, the broadcaster (or tweeter? ), the thespian, the banker or financier...the list is varied with expansive Jupiter (which turns Direct on June 9th @13Lib12). Venus @7Ari11 in 6th house of Military, Police, Civil Service, Work, Health, and Daily Rounds) also rules the 8th house of Corporatism, Credit, Debt, Insurance, Legacies, Shared Resources, the Occult, and Transformation (including Death) so all, any, or none of these areas may be affected including the 2nd house of the National Treasury with the Full Moon @20Sco24 posited there and denoting fluctuations and changes in resources and valuations. 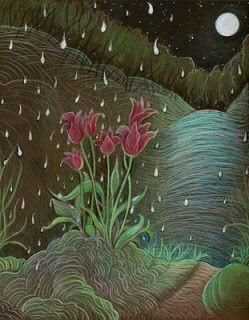 Of course, the Taurus-Scorpio axis includes financial issues all on its own and a Full Moon relates to a culmination or fulfillment of some kind--certainly an awareness or the typical uncovering that the spotlight of a Full Moon can bring. For as you know, lunations may act like eclipses and planet Uranus--revealing secrets and hidden matters no matter how inconvenient. 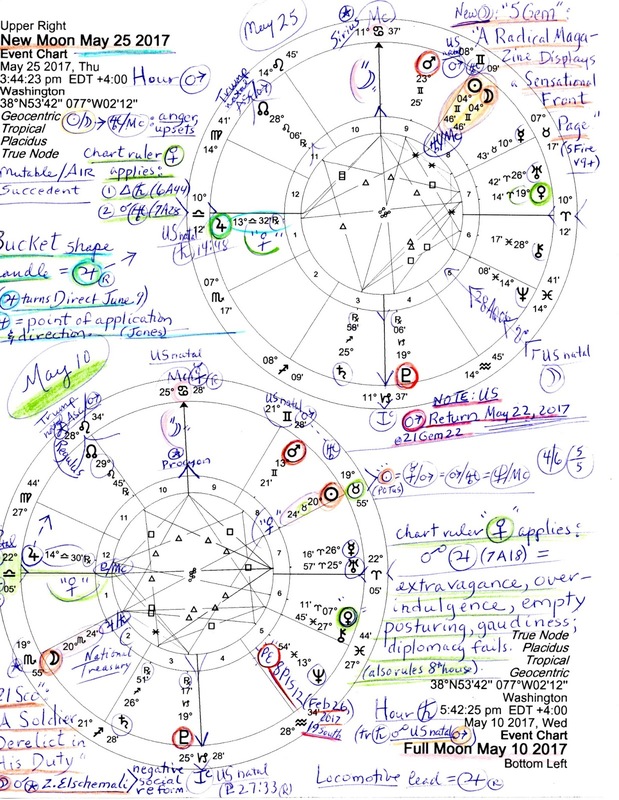 In addition, this Full Moon chart shows the US natal Mercury-Pluto opposition on the MC-IC axis which suggests our usual surveillance concerns, spying, leaks, hacks, revelations, and other events. Then three days after America's 2017 Mars Return (21Gem22; May 22nd) on May 25th comes a New Moon with the three days leading up to the lunation the 'dark of the Moon' phase when things tend to go bump in the night, or at least, in the shadows. In DC this New Moon falls at the end of the 8th house suggesting a new cycle of activity in 8th house matters (listed, above). 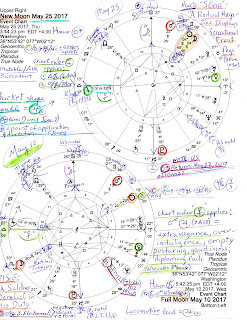 The New Moon's Sabian Symbol is penned upon the chart (upper right) and its word picture ("A Radical Magazine...") seems to hint at certain publications such as Breitbart with sensationalism in the lunar mix (Moon = publicity, the public, public relations) especially since Moon-ruled Cancer is on the MC and rules the 10th house of Public Reputation in both charts), or perhaps pulp publications such as The Enquirer are spotlighted. The question is: what will be the 'radical' topic? Now in the New Moon horoscope, chart ruler Venus applies in major aspect twice: 1. trine status quo Saturn Rx (@25Sag58 in 3rd house of Communications, Short Journeys, and Primary Education); and 2. conjunct Uranus, America's planet of war, and of Utopian visions, chaos, and disruption. Note that quirky Uranus is also the predictably unpredictable Mr. Trump's oriental planet. 1. Venus trine Saturn denotes a period of success in such realms as legal matters, diplomacy, and alliances; promotions that provide greater authority may be the reward along with improvement in relationships with those who are more mature and responsible. 2. Venus conjunct Uranus indicates the forming of unusual or non-traditional partnerships via unique methods that are employed for the achievement of common goals--though separations may also occur. Plus, with Venus-Uranus contacts, wasteful or eccentric spending habits cannot be ruled out which supports the extravagance shown by Venus in the May 10th Full Moon horoscope. One can't help but think of Melania Trump, her husband, or both. Yes, money planet Venus in adventurous Aries loves change and variety but hopefully the extravagant Mr. Trump's expensive vacation habits, Melania's and Donald's out-of-DC security expenses, and the Trump administration's bombing excursions won't plunk America and our National Treasury into the alms house of debtor nations before we can 'get a grip'. And yet it isn't as if the American people can depend upon our dysfunctional and highly partisan Congress to reign in excessive spending by a Republican president, now can we? Unless 2017's US Mars Return on May 22nd, which indicates limits to activities and adventurism via transit Saturn's off-and-on opposition to our nation's warring Mars, denotes the traditional mission of congressional fiscal oversight!